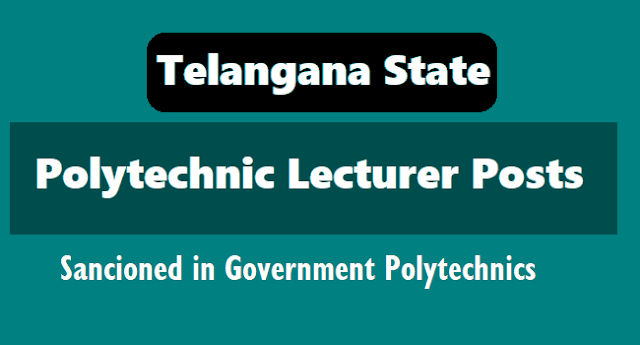 TS Polytechnic Lecturers Posts Sancioned in Government Polytechnics 2018: GOVERNMENT OF TELANGANA, TECHNICAL EDUCATION - Creation of (199) Lecturer posts for the 2nd Shift Polytechnics in the existing eleven Government Polytechnics for the Ist, IInd & IIIrd year classes in the State of Telangana, under the control of Commissioner of Technical Education, Telangana State, Hyderabad - Orders - Issued. 2. From the Higher Education (TE) Department, U.O.No.3622/TE/A1/2015, dt:03.05.2017. 3. Higher Education (TE) Department, U.O.No.3622/TE/A1/2015, dt.31.03.2018. The Commissioner of Technical Education, Telangana State, Hyderabad (CTE) in the references 1st read above, has furnished proposals for the creation of (199) teaching posts for eleven 2nd Shift Government Polytechnics in the State, under the control of Commissioner of Technical Education, Telangana State, Hyderabad. 2. In the reference 2nd read above, the Higher Education (TE) Department, has proposed for the creation of (199) teaching posts in eleven 2nd Shift Government Polytechnics in the State, under the control of Commissioner of Technical Education, Telangana State, Hyderabad. 3. Government after careful examination of the proposal, hereby issue orders for the creation of (199) Lecturer posts in the pay scale of Rs.15600-39100+AGP 5400 for eleven 2nd Shift Government Polytechnics in the State, under the control of Commissioner of Technical Education, Telangana State, Hyderabad, as appended to this order, from the Academic Year, 2018-19. 4. The Higher Education Department shall furnish the Direct Recruitment vacancies out of the above sanctioned posts for issue of orders to the concerned recruiting agency so as to notify the same for recruitment. 5. The Higher Education (TE) Department/Commissioner of Technical Collegiate Education, Telangana State, Hyderabad, shall take necessary further action in the matter accordingly. Appended to G.O.Ms.No.37 Finance (HRM-I) Department, Dated:12.04.2018.